There are dozens of community theaters in the Twin Cities metro area performing at high schools and community centers. In this relatively quite summer theater season, I decided to check out my local community theater, which is Mounds View Community Theatre, now in their 31st season. I heard great things about their production of Les Miserables last year (which I missed, in part, because I knew I was going to see a spectacular production at BCT in the fall), so I was curious to check out their production of Rodgers and Hammerstein's Cinderella this summer. Unfortunately the stormy weather interfered with my plan to bike to nearby Irondale High School, but it was still a fun thing to do on a summer afternoon. The show is quite charming and adorable with several standouts in the cast. Moral of the story: get out and support your local community theater! As Cinderella, Mari Holst is truly the star of the show. She just shines onstage, with her beautiful voice and natural, charismatic stage presence (plus, I love a princess with short brown hair - take that Disney!). She's well-matched by Mason Henderson as Prince Christopher (really? Christopher? ); they sound beautiful together. Other standouts in the cast include Haley Garland as the Fairy Godmother and Anissa Lubbers and Erika Sawyer as the very funny stepsisters. The ensemble does a fine job, and the littlest members of the cast are the most enthusiastic and fun to watch. And, as always, I was thrilled to see and hear a large live pit orchestra (ah, if only I hadn't given up the clarinet!). It was fun to see so many kids in the audience. Community theater is an easy and relatively inexpensive way to expose children to theater at a young age, both as audience members and performers. 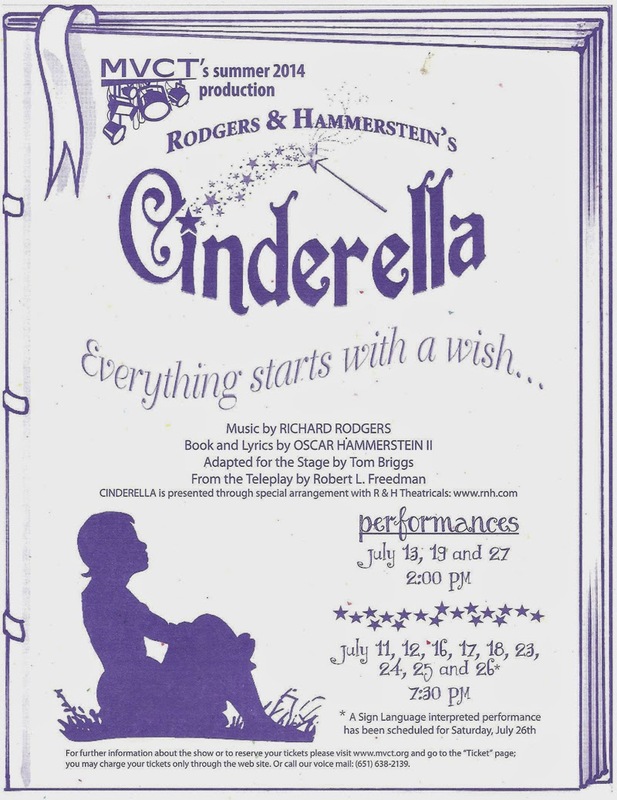 If you're in the Mounds View area, go check out Cinderella, playing through July 27. If not, go see your local community theater. A couple of examples: Minnetonka Theatre is doing Mame and Spelling Bee (and they're also hosting Tony winner Karen Olivo, who now lives in Wisconsin, in an auditioning workshop), and Chaska Valley Family Theatre is doing the comedy Laughing Stock. Theater is everywhere - check your local paper or community bulletin board to find it. Jill, thank you for checking out the Cinderella musical and for the accurate review of the show. Your blog is a valuable site for community theater! I will pass the word on about it. I've seen Cinderella a few times now and actually have two children in the show as well. It seems to get better every time I see it. The leads are top notch and they are backed up by a very talented and energetic ensemble. MVCT seems to always pick a great cast that normally performs well. Thanks again for your blog. Thanks for the feedback John. I figured it was about time I check out MVCT since I'm in the neighborhood! I look forward to next year's production! Hi Harry. I'm afraid I can't help you with that, you could try contacting MVCT or other community theaters in your area.